Link to Crowdfunding for sustainable slacklining in Bern. 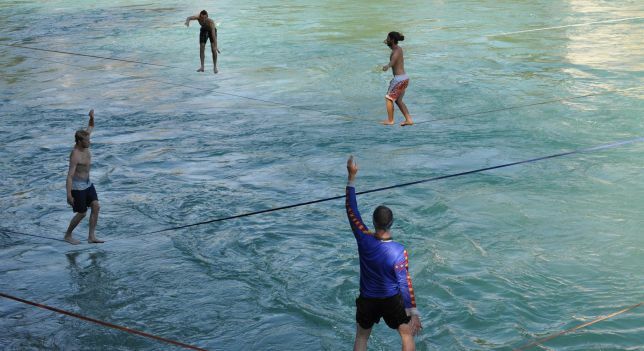 10km on a slackline (waterline) in a day from SLACKATTACK – Slackline Crew. It’s not my strength to get up early, but I knew it was the key to go for 8k on a slackline, especially since we would try this over the river on waterlines. 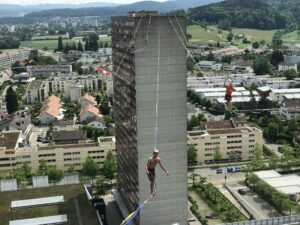 in Mai during the first Highline FundRACE in Zürich, Switzerland where 12 Athletes walked as many meters as possible on 6 parallel 140m Highlines. At the FundRACE 100m segments were taped and the athletes walked back and forth between those, walking the highlines 80 times or 8k in a day. I have no clue if anyone has tried to walk more than 8k in 24h or one day. This nr. just popped up during this event. 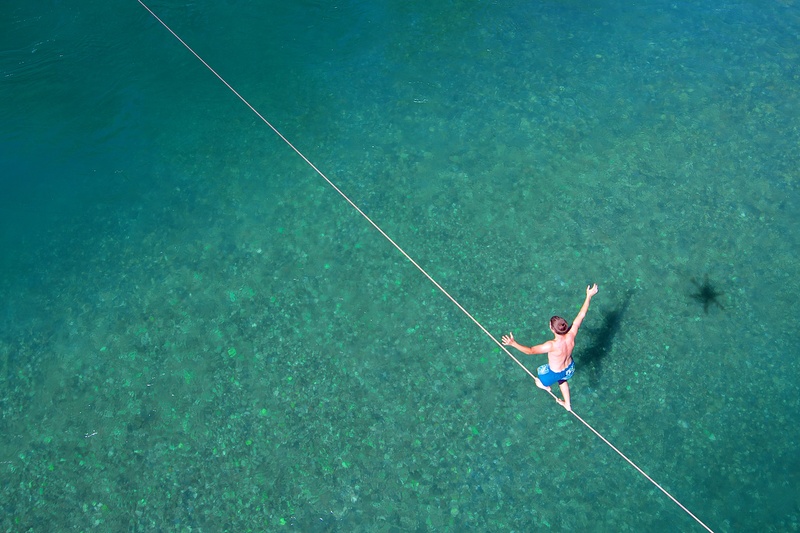 Picture from the Highline Fundrace, organised by Swiss Slackline and the ISA. 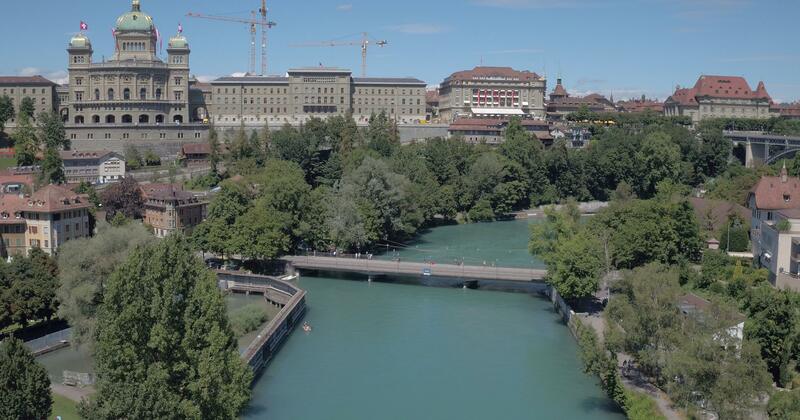 The idea was to try something different, but still comparable in terms of distance, here in Bern. 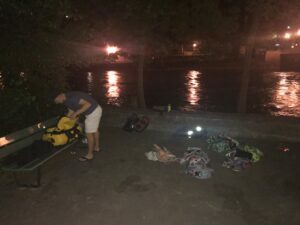 For ourselves, but also as publicity for our crowdfunding campaign to build large slackline and waterline posts along the river at our favourite spots in Bern. Nick arrived by foot and i came by bike to our spot at Dalmazi in Bern, Switzerland. As we were making the connection of the lines on the bridge, the police stopped in their car, a policewomen asked me what we were doing. I breefly refrained from talking, but before I could answer she said – „Its just the slackliners“. I laughed and answered we were starting out early today. Setting up the lines in the dark, we did not use a headtorch to attract attention. This means that the forces on all the lines and anchors was usually somewhere between 1.5 and 3.5 kN (150-350 kg) with us on it. us did several hundred turns during the day. All the lines we rigged during the day. River temperaturs: between 17.5 and 20.5 degrees celsius. We finally stepped on the lines for the first time. But shortly before that I smashed my finger during warm up and was bleeding before I stepped on the line. Then I also miscalculated the tension on the rodeoline, which meant I landed in the river on the very first try, not a good start. I wanted to begin with dry feet, since I knew they would suffer the most, especially if they got wet alot. I also wore knee pads during the day to keep my knees warm all the time – they can definitely become a weak point when endurance slacklining. I wore a hat and sunglasses. I protected my ears from a sideways impact with a waterproof music player, which I used to listen to music, although I did turn it off from time to time. The hat, walkman and sunglasses were attached to a headband with a short string. Breakfast, we both felt tired and progress was slow. A nice steady wind is one of the key factors that can make a line easier to walk. This is especially noticeable on longer lines, but I now also felt the difference after sessioning these smaller lines without the slightest breeze. We also decided to add no windstoppers, if not necessary. I also decided to go for shorter sessions, with lots of pauses and do more of those – instead of going for a couple long sessions. All we did so far was walk, eat and drink, we had very little pauses. We reached about 2.5k and where exhausted already, our knees and shoulders were beginning to hurt a bit. We thought about giving up for the first time. My feet were burning, I switched to using soleruner shoes. Nick continued on bare feet. I took a 15 min speednap. With 3.5k each the progress was slow, we talked about giving up for the second time and thought about chilling during the afternoon… we did not. The light reflections from the river made us walk with full sun protection. Nick started to complain about his feet hurting. Dalmazi is our prime waterline spot! Help us fund massive anchors along the river. Drone shot from our spot, crystal clear water. 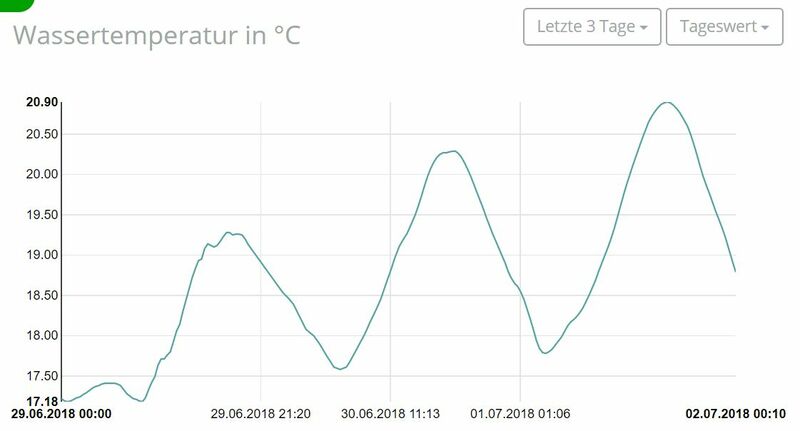 It was hot, record temperatures for Switzerland with about 30 degrees celsius. We used lots of sunscreen and were wearing hats. The cooling river was near, but I knew with every fall my skin would get soggy and therefore weaker. We both had two involuntarily falls into the river throughout the day. In total together we caught the line about 20 times, almost every time right after turning. We were at about 6.5k each and the 8k felt within our reach. Giving up now was not an option, we knew that it would be harsh from this point forward. Sometimes it felt like low energy and therefore high efficiency speedlining, staying relaxed was important. We documented the laps with lists at every anchor and a gopro time lapse with pictures. 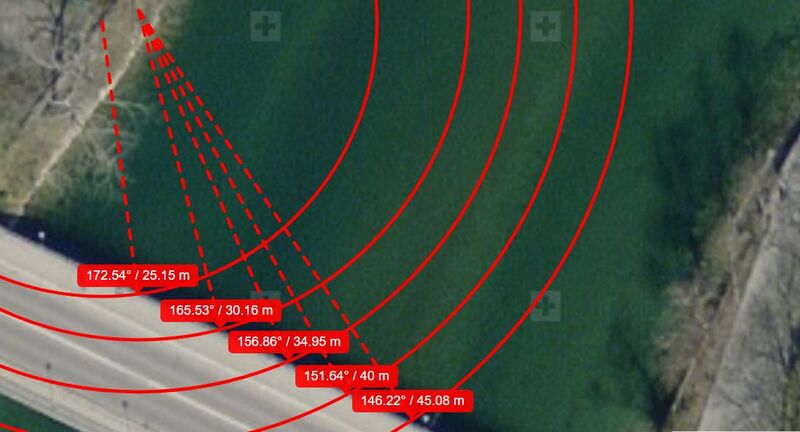 For future tries I would recommend a high precision tracking (gps, bluetooth, wlan, etc.). What I found before the record attempt was not good enough due to low precision or high cost. If you can think of a solution for this one let ISA Sport know. the lentils Anita made for me, but it could also just be the sugar from the dates. We definately had too many magnesium tablets. I decided to continue and go for 10k. Nick’s feet were burning, he decided to stop after 8.1k. The last 500m were painful. It was turning dark slowly and I was in a delirium. I finally finished the last laps and was exhausted – only two people were left for the celebration. Later I found out that i miscalculated and walked more than 10.7k….. We still had to derig and pack all the gear and ride home with the bike. Thanks to Nick, all the helpers, the deriggers, Anita for the massage and the food! At midnight I was happy and sound asleep within 30 seconds. Written by Thomas, corrected by Marc, pictures by Killian and others, Maggie for the Posters, video by Nick, thanks! 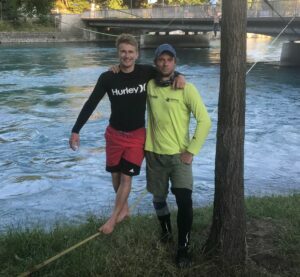 This entry was posted in Slackline and tagged aare, bern, FundRACE, record, slackattack, slackline, waterline, worldrecord. Bookmark the permalink.